Mundane cobra liles are a predatory plant named for a fanciful resemblance between their hollow, folded-over tube leaves with a protruding curl to the head of a rearing snake that is sticking out its tongue. 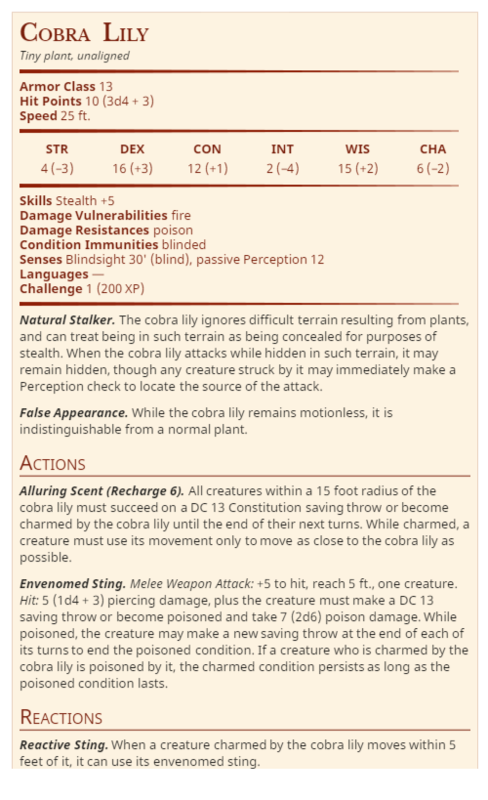 Some arcanist in ages past found inspiration in this semblance for dire experiments with an ambulatory and venomous variety, creating a petite and unassuming assassin with a deadly sting. As cobra lilies propagate by sending out runners, it was almost inevitable that the creation would escape into the wild, where they may be encountered either as natural growths or deliberately sown guards. Black and green dragons in particular are known to cultivate them throughout their territory. The cobra lily is an example of a monster that is more of a hazard than a straight-up battle. It has few hit points and wouldn’t last long in a stand-up fight as a solo creature, but a party who unsuspectingly runs into a patch of them can have a few good “uh oh” moments. They can make for a good sideline threat in any fight against a larger monster that takes place in an overgrown environment. At the DM’s option, not only may the poison from the plant’s leaf-sting be harvested, but the fluid responsible for the plant’s alluring scent may also be preserved and distilled into a more potent form. This form, if sprayed as droplets in the air and inhaled, makes the victim susceptible to the next suggestion made (as if they were under the effects of the suggestion spell) if they do not succeed on a DC 13 Constitution check. The difficulty of processing this fluid and the value of the resulting fluid should depend in part on how rare the DM desires such an item to be. 250 gp would be a good benchmark, as it would be similar to the value of a scroll of suggestion. This entry was posted in Gaming Stuff and tagged monday morning monsters by Alexandra Erin. Bookmark the permalink.